Just when I thought May is the greatest month of all, June kicks me with an awesome news: A Spa Party by The Butterfly Projects. Just in case you forgotten what is The Butterfly Project. As you might know, I've attended a few events organized by The Butterfly Projects: The April Unzipping Bag of Love event and La Senza Body Kiss Bloggers' Party. This coming June, the gathering would be themed on Spa Party! This is great, I mean I have never been to a spa party and I only read about them online. How I wish I could have the opportunity to join the party! To be short, here are the awesome people that is going to make the spa party as awesome as it is. Eh, Spa Party is awesome hor. You get to do a lot of things in a spa party, pampering yourself from head to toe; cat fighting (bonding session) with your girlfriends; eat every snacks on the table; paint each other's face with masks or even take lots of photos together. After all, it is party for girls. I haven't been to any spa party before and I've read across the Internet about it. Now here is a great chance for me to to be in the spa party, isn't it great? Simple, why would I want to join the Butterfly Projetct's Spa Party then? #1 A chance to be treated like a Noble Lady. Have I ever mention before how I love myself to get pampered like a Lady? No, not queen, being a queen is too common LOL. I got pampered with TT Masks every now and then ever since I got exposed to TT Mask's awesomeness. Ya lah, I pampered myself by putting the mask on my face, not having anyone else to help me to do one lah. A Lady must get herself ready with beautiful nail designs too! It was fun to read fellow bloggers attended the Posh! 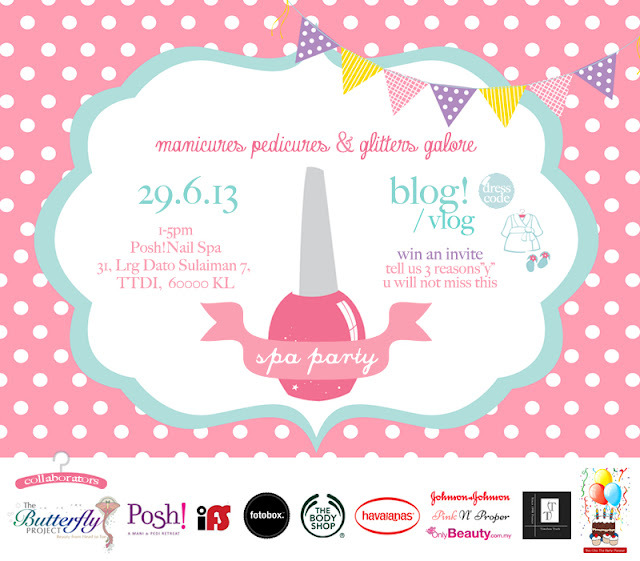 Nail Spa launching Event at TTDI. They got themselves pretty nail designs. I wonder when will it be my turn eh? Now, being a Lady have to present herself at her best right? Spa Party has invited Johnsons and Body Shop to take care of the selected ones in the party. Natural ingredients to pamper the body, I guess that is the ultimate enjoyment for a spa party. Do you know ambient plays an important role for your appetite? Tres Chic certainly a great party planner as all their set up was awesome! Just look at some of their portfolio below, isn't it lovely? So just when you are amazed with all the set up and decorations, here comes the food! Hello? Food is the highlight for the ambient ok? For this coming Spa Party, Idea Food Solutions will be the partner to prepare all the scrumptious food. With all these perfect food and decorations, we cannot miss out taking nice pictures with them. This time, Fotobox has came out with an unique idea for the invited guests. I can't wait for that day to come (and if I'm the lucky one to get selected) and take tons of pictures with the girls! Well, taking pictures are one of my hobbies. From the pass events I've attended, I learned a lot from the founder and organizers. Thanks to The Butterfly Project and Tammy, I made a lot of new friends and from then, I knew I have a long learning journey ahead. There are knowledgeable experts in the industry whenever I attend the events. 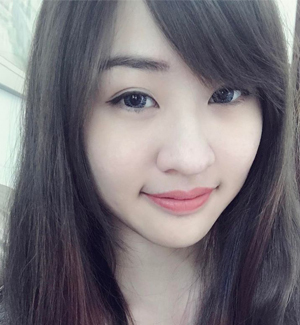 I've so much to make myself prettier, to build self-confidence and then, to trust and love new friends. All of these are precious moments for me and being noted down within my memory. Since June Spa Party is going to be a huge one, I would like to be the chosen one to attend this spa party. All of the awesome partners around would definitely enrich my experience and not to forget, I would have a greater bonds with the girls who attend to the spa party. So ladies, how could you miss out such a great opportunity? There is a simple way for you to join this awesome spa party. Check out HERE and be one of the lucky 50 bloggers or vloggers for this coming June Spa Party. This sounds great for a pamper-yourself weekend. Also, I nominated you for the Liebster Award! You can see it here.